Even though all human beings deal with this separation from God, it still matters, a lot. Question: What in today’s society separates us from God? Now, sometimes people will say “if you are right, then we are all in the same boat, we’re all sinners with no cure, so what does it matter?…”Pobody’s nerfect” and so I’ll just give up on trying, it’s no big deal. Well, it does matter because of the destructive consequences of sin in our lives. 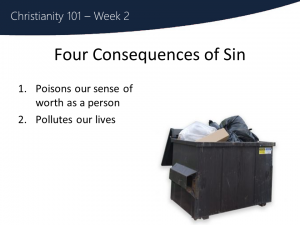 I want to spend a bit of time with you now looking at 4 of the consequences of sin in our lives. Firstly, sin can poison our sense of worth as a person. Without God, our sense of worth may seem solid on the surface, but it never really is—it can be poisoned in an instant. If I build my identity on being great at my job, and I lose my job, I lose myself, too. This is a terrible way to live, feeling like you could be shaken to the core at any time. If we take our meaning in life from our family, our work or a cause (no matter how good and worthy they are) it enslaves us, like an addiction, and we’ll do anything to preserve it. These addictions can even be very good things – think of food. God created food as a good, necessary thing in life. But we all know what happens when we take food out of its context, and people begin to find happiness, fulfilment and peace in their food and nothing else. It becomes a very unhealthy, dangerous thing. Other times, we can also become addicted to negatives like pride, anger, gossip and envy. We can get into patterns of behavior or patterns of thought that on our own we cannot break out of. Either way, sin can poison our sense of identity and self worth. Secondly sin can pollute our lives. I remember when I was a paramedic, after a call I would take off my gloves, sometimes two pairs, and then wash my hands. All normal. But then I couldn’t fathom the idea of going to Tim Hortons and eating a donut with my hands. I knew where they’d been. I didn’t feel that I could get them clean enough. Jesus knew that no matter how much we clean up our exterior, the interior still feels unclean…sin is more than skin deep. For example, if you know someone who is sweating profusely, and says their left arm aches and their chest feels heavy, you can give them a towel for the sweat, ice for their arm and an antacid for their pain. But they will still die of a heart attack! The problem isn’t only the outside symptoms, but the heart disease that caused them all. It’s the same with our sin – the breaking of commandments (what we often call sins) is the external symptom, but we need to treat the heart disesase that has caused those symptoms in the first place – our sin problem. Sin is a disease, and sins are the symptoms. What in today’s society separates us from God?